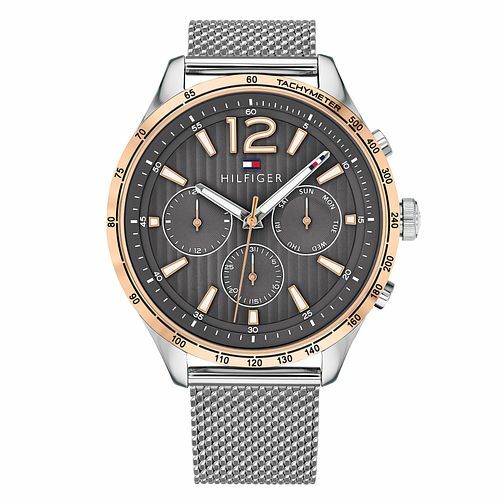 This casual men's sports watch by Tommy Hilfiger features a stainless steel mesh bracelet and 46mm case with rose gold IP bezel and a grey multi-eye dial. The dial is complete with day and date and the signature Tommy flag logo at 12. It is water resistant to 5 ATM and comes with a 2 year international warranty. 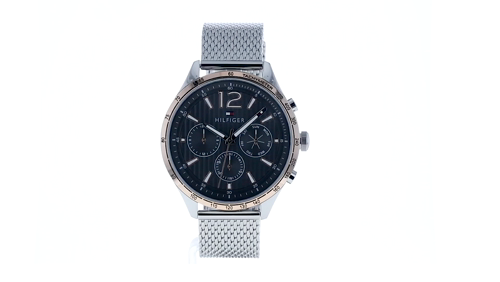 Tommy Hilfiger Men's Stainless Steel Mesh Strap Watch is rated 5.0 out of 5 by 2. Rated 5 out of 5 by Anonymous from Good looking watch Very pleased with the quality and it's good looks, I have received several nice comments from strangers regarding this.